Not to cover my post weekend face, but to help restore hair back to its healthy best. There are a whole range of hair masks on the market, so I'm going to take the pain out of picking the right one for your hair. 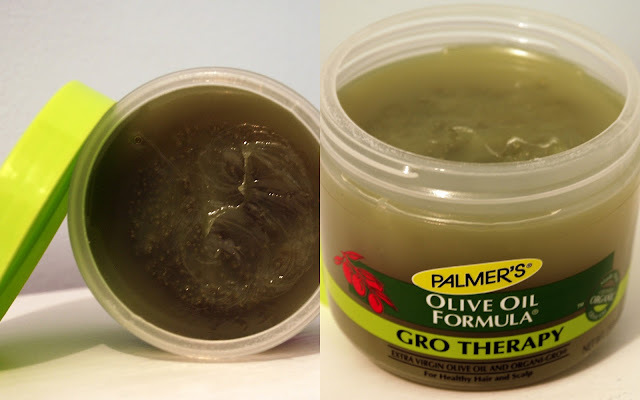 I picked up this huge pot of Palmer's Olive Oil Formula Gro Therapy in my local Salon Services a few weeks ago. It'll last an absolute age and will be tucked away in my giant supply cupboard for a now and again treat when hair is feeling a little hay-like. Whilst it must be said it doesn't look that fantastic, it smells lovely, and is great value. Palmer's do a whole range of nourishing treatments and shampoos. And they are against animal testing, which is a big plus in my books. I found the Gro Therapy under the Ethnic Haircare section of the store and for a purse friendly £4.19 (250g) it's great value for money. The formula contains Vitamin E, A and D, along with Soy Protein. Vitamin E promises to promote healthy, shiny hair being a natural antioxidant. It helps protects the hair shaft from further damage, giving hair a chance to grow longer. Used as an intensive treatment overnight will leave hair feeling soft and conditioned. Those who have dry, over processed hair will definitely benefit from an overnight treat. It's also great at defining curls, so if you want to wear your hair as nature intended it can help frizz and add shine to hair. Add a little to the ends of dry hair to define styles. If you find you suffer from a dry scalp, this can help to moisturise and condition. Around this time of year our hair can suffer from the change in weather and it's important to keep on top of any haircare problems. Do battle whilst they are small problems and you'll find they are easier to solve. If you have fine hair, I'd give this a miss. Or use very sparingly on the ends of your hair to help recover those dry, over processed ends (ombre girls I'm looking at you) If you have naturally very straight hair I'd also give this a miss, as it may be too heavy. But for a once in a while pamper it wouldn't do any harm. It's not just for pampering treatments. If you have a sleek and chic up do, warm a little between your fingers and use to tame flyaways. It'll give you a high shine finish and condition the hair at the same time. So give your hair a pamper this week, and look out for next weeks Monday Mask. - send me an email and let me know, I'll try my best to recommend one! “Đã vậy, chúng ta lên đường thôi. Ngọn núi phía trước chính là Minh U sơn, chỉ cần chúng ta xuyên qua ngọn núi này là sẽ đến nơi chúng ta cần đến. Hiện tại, xuất pháàn người Tiêu Viêm lại một lần nữa lên đường. “U Minh sơn này có gì đó bất thường thì phải.” Một tên dong binh đột nhiên nói. “Bất thường? Bất thường chỗ nào? !” Một tên dong binh khác hỏi. Tiêu Viêm quan sát hai người này, hai người này hình như là hai dong binh cuối cùng gia nhập đội ngũ. Một người tên là Mông Vũ, người kia tên là Vương Bằng.